The growth period is approximately 18 to 24 months. pink and aubergine. These pearls have become some of the most sought-after expensive pearls in the world. 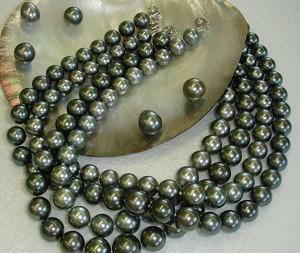 thousands of loose pearls to create a single strand. These pearls have an average size of 8 to 15mm, but some very rare gems larger than 18mm have been found. The shapes are separated in round, oval, button, tear drop, baroque and circled.